Stargazers will love this star spangled glitter printed top. 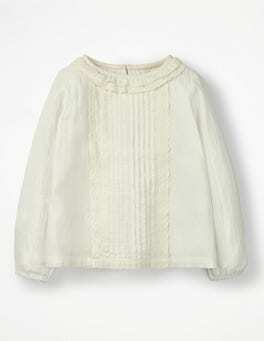 The dainty ruffled neck can be worn buttoned up or down and the long sleeves are elasticated for extra practicality. In easy-to-wear cotton with a loose, comfortable fit, it's simple to slip on and shine. It’s a party top of two halves, but both with a smattering of foil-printed spots. The sheer woven bell sleeves reveal a subtle hint of skin, while the jersey body provides the necessary coverage. It's the details that make all the difference on this top. 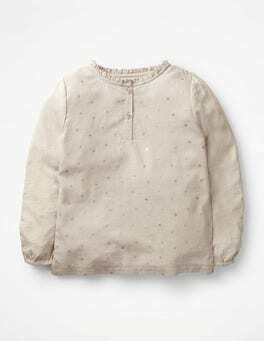 The front is made from throw-on-and-go slub cotton, while the woven back and short sleeves have an intricate broderie design. Perfect for rising stylishly to whatever your day brings. Baby can never have too many easy-to-wear tops in the early days. We added an ivory broderie collar to this one – because why should essentials be boring? 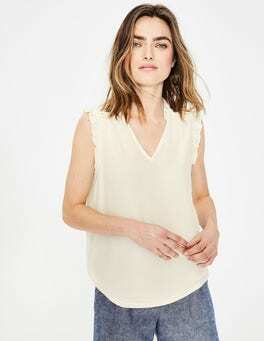 Ruched sleeves and soft 100% cotton fabric make it oh-so comfortable, while poppers all down the back make it oh-so practical too. 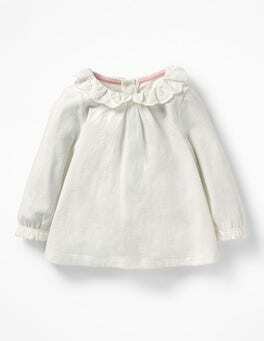 Get the party started in this woven smock made from 100% cotton twill with ruffle collar and cuffs. 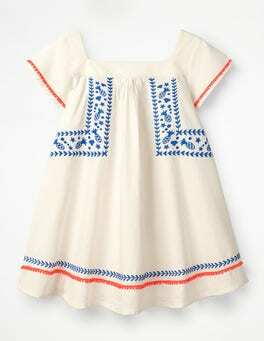 It's lined for cosy play and features buttons down the back for easy dressing. With a sweet floral print and rickrack detailing, this top pairs perfectly with our woven bottoms. Birthday party dressing? It's a doddle with this lace-trim cotton top. 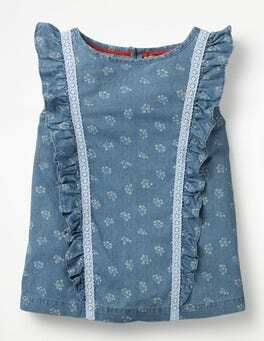 A frill flutters from shoulder to hem and befriends some pintuck detailing on its travels. Smart occasions call for teaming it with slim-fit trousers but it looks equally lovely with jeans. 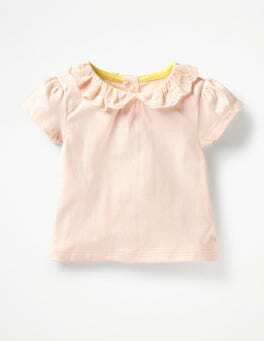 This ruffle-neck swing top is perfect for popping on and heading off. 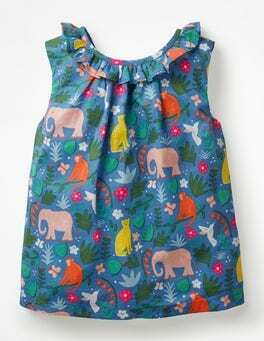 The charming print makes it smart enough for afternoon tea but it's casual enough for playing in the garden afterwards. It has a modern V-shaped back and is fully lined for a comfortable feel. 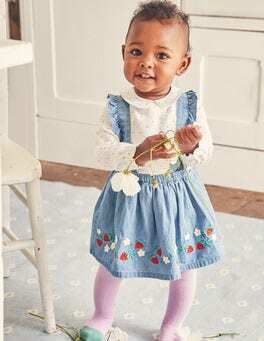 This skirt set in chambray or corduroy is ready for hours of crawling, bouncing and tumbling. 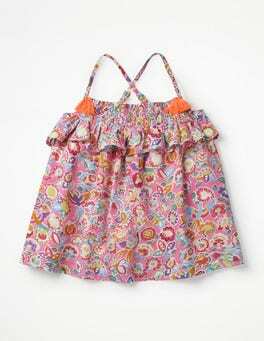 The soft-brushed top has a fun all-over print and frilly collar. A row of buttons down the back means it’s easy to pull on and off. This flocked jumper wins all of the hearts. Washing-machine-friendly and woven from a soft cotton blend, its (top secret) ingredient is a dash of cashmere for a rather snug feel. The highlight of these bikini bottoms? A colourful braid at the sides, which is woven by hand. These bottoms are comfortable thanks to the lining and can be paired with the matching bikini top for a chic look. Woven cotton to the front, jersey cotton stripes to the back – this T-shirt has a different texture and style on each side. Will it be galloping horses, fun flowers, juicy cherries or doodled dogs? The slightly boxy shape is lovely and breezy so it's ideal for sunny afternoons in the garden. How to get into the springtime spirit, step one: eat all of the Easter eggs in reaching distance. 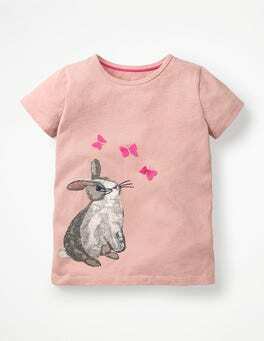 Step two: hop to it in our pink, pure cotton T-shirt that features a grey and white stitched rabbit. Step three: count how many fluttering butterflies, woven with sparkly thread, you can find.